Print 29 (station no. 28) from “53 Stations of the Tōkaidō”. 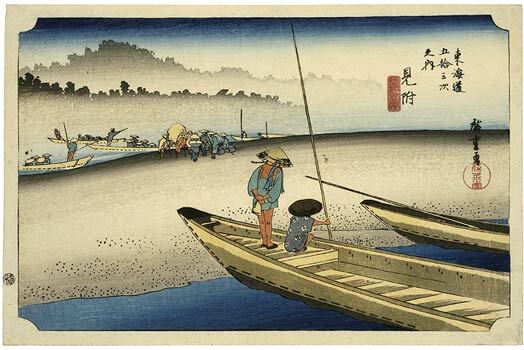 This series of woodblock prints, which was one of Hiroshige’s most famous alongside his Hundred Views of Edo, was based on the “travel guide” Tōkaidō meisho zu-e (“Illustrated Guide to Famous Places along the Tōkaidō”) which was published in 1797. Mitsuke marked roughly the halfway point on the Tōkaidō route; the name refers to the fact that this is the first place on the way from Kyōto to Edo where Mount Fuji can be seen. Although this is a fine impression, conveying something of the stillness of the morning mist, as the boatmen wait for passengers on one bank of the Tenryū River which marked the midpoint between Edo and Kyōto, the earliest impressions are those with two long black horizontal lines printed just above and just below the misty tree tops in the middle distance extending from a point near the left edge of the picture to over half the distance between the boatman’s pole and the title cartouche. Several impressions in this state are known (one is reproduced in colour in Ukiyoe Taikei, Vol. 14, no. 29), and they seem to have been intentional rather than an accidental effect as some Japanese commentators have supposed. At first glance the lines are strangely disconcerting, because stray-seeming lines like these simply do not appear on Japanese woodblock prints. No doubt this uneasiness persuaded the publisher to remove them. Nevertheless, they served a purpose which went over and beyond the artist’s interest in conveying bit of scenery or a mood. They show that the picture was composed, as all of Hiroshige’s pictures were composed, with a great formal sense and deliberate geometry. When this is fully understood Hiroshige will finally be appreciated for his intelligence as much as for his sensibility, for had mind as much as for his feelings. Reproduced in Ingelheim catalogue, no. 125.